November The November meeting of the society met with Mary Miller on the 13th of the month, meeting called to order by Pres. Opening with singing and Scripture reading. Song. Reading from the lesson Leafs, Subject Orphanages in India. Minutes read and approved. Reading by Etta Miller Song by Mary Miller & Dora Kendall. 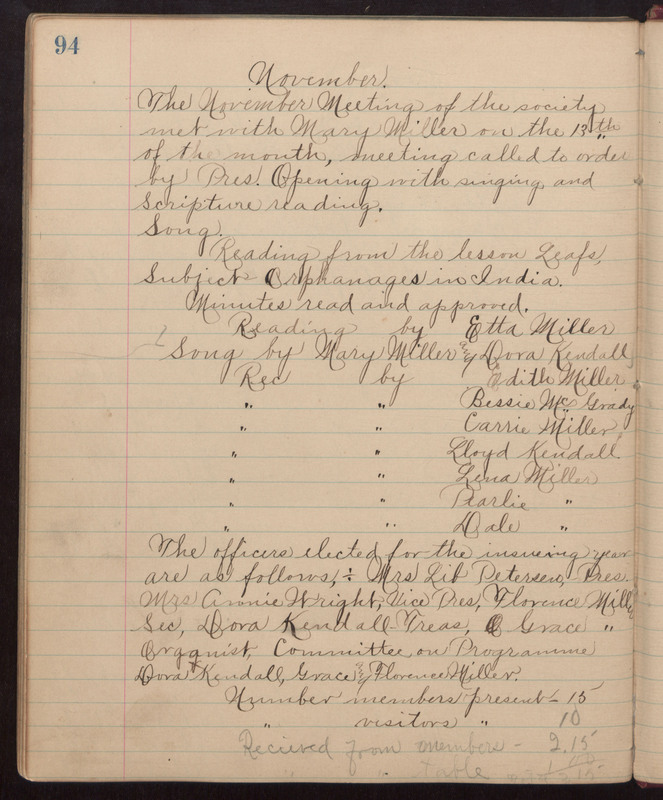 Rec by Edith Miller " " Bessie McGrady " " Carrie Miller " " Lloyd Kendall " " Lena Miller " " (Dearlie?) " " " Dale " The officers elected for the insueing year are as follows,: Mrs Lib Petersen, Pres.